In an article I wrote some time ago, I explained the essentials of in-memory caching in ASP.NET Core. Although in-memory caching serves its purpose in many small applications, at times you need distributed cache rather than local in-memory cache. Consider a situation where a web farm is serving the requests. In this case you can't guarantee that the server storing the cache will serve all the requests. You may also want your cache to survive application restarts. Caching systems such as Redis (and its implementation on Windows) can provide in-memory distributed cache. SQL Server based caching can provide database driven caching. This article discusses how to use the SQL Server distributed caching in ASP.NET Core application. I assume that you have create an ASP.NET Core web application as outlined in the previous part of this article. Adding the first package is a straightforward thing. Just right click on the Dependencies folder and click on Manage NuGet packages option. Then search for that package and hit Install button to add it to your project. Once you add the NuGet packages, build the project so that packages will be restored and made available for further use. In the above "create" command you specify the database connection string of the database acting as the cache item data store. The connection string is followed by table schema and a table name of your choice. Observe the columns of the table. A cached item is stored as a binary data with its string key. Sliding expiration and absolute expiration values (if any) are also stored for that item. Now that you have created the required table, let's add it to the services collection in the Startup class. The AddDistributedSqlServerCache() method registers the cache object with the DI framework. While adding the SQL Server distributed cache a few options are configured. The database connection string, table schema and table name are specified as the configuration information. The code declares a variable of IDistributedCache. The SQL Server distributed cache implements this interface. We use interface rather than concrete object so that future changes to the caching system will be easy. The constructor of the HomeController receives IDistributedCache object through DI. The IDistributedCache interface consists of methods such as Set(), SetString(), Get(), GetString(), Remove() and Refresh(). Once you receive the IDistributedCache object you can call these methods on it from the other actions. Now let's see how you can store an item in the cache. There are two methods - Set() and SetString() - that allow you to add an entry to the cache. The Set() method takes a string key and a value as byte. The SetString() takes a string key and a string value. The code stores current date and time in a string variable. The string is converted into a byte using GetBytes() method. 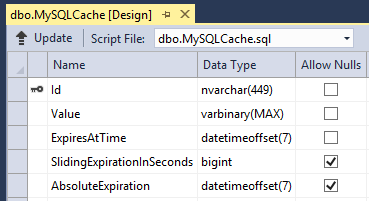 Finally, an entry is added to the cache using the Set() method. As you can see, using SetString() is quite straightforward. You might be wondering how objects can be stored in the cache. There are two approaches to do this - serialize objects into a byte and then store into the cache. Or convert objects into their string representation and then store in the cache. Let's use the later approach to store an item in the cache. The code creates an Employee object and sets its properties. The code then uses JsonConvert class (Json.Net component) to convert the Employee object into a JSON string. The JSON string is then stored into the cache using SetString() method. Make sure to add Json.Net NuGet package before writing this code. Notice the use of GetString() for converting the byte into a string. The above code creates a DistributedCacheEntryOptions object and sets its AbsoluteExpiration and SlidingExpiration properties. The DistributedCacheEntryOptions object is then passed as the third parameter of the SetString() method. That's it for now! You can also try Remove() and Refresh() methods of IDistributedCache to see how a cached items can be removed and refreshed respectively. For more details about distributed caching go here.